I am still in the middle of boxes and no kitchen cabinets and no silverware and tons of boxes filled with junk stuff…the bad news is that I need to cook tomorrow for some new clients and that I am still wondering how it will happen…All I want right now is sleep 24 hours straight. This is the second post featuring a sandwich, just because I am not a sandwich fan…but sometimes, they can be fun to make, even if you don’t eat them. I wouldn’t say this is a quick one to make, since you need to grill your vegetables first but still it’s fun put it together and look at all the bright colors combined. When you organize a picnic party, those can come in handy since they’re tons of vegetables packed in two slices of bread, so instead of eating junk food at a picnic, you can actually enjoy some healthy food. Sandwiches for me, were only eaten during the time my parents and I would leave Nancy to drive to Italy. My mom would make a few of them for the 10 hour drive trip, since my dad would drive straight, without any stop in between point A to point B. You needed to have some sort of food handy in the car. My mom would get up at 2 am and make a few panini per il viaggio and by 3 am we would be on the road. I hated to get up at 2 am…but my dad always wanted to hit the road on Sunday at 3 am because there would be no truck on the freeways (trucks don’t drive on Sundays) and the freeways in Europe are not as large as the one in the US…now at 70 years of old, he still gets up at 2 am to hit the road at 3 pm and there is nothing and no one that will make him change his mind. In France, the most traditional sandwich you get, is the jambon, beurre, cornichons = ham, butter and cornichons (It’s not really a sandwich country). On a great crunchy baguette, with great ham and salted butter, it’s wonderful. What I like about the real French baguette is that there is very little crumb, the middle is airy and not dense, so it’s not as filling as some other breads. Now many boulangeries are making some fancy sandwiches with all kinds of baguettes and all kinds of stuffing (but always on baguette) and even though I am not a sandwich fan, I somehow like the ones on baguettes once in a rare while because they have a lovely crust and almost no mie (the breadcrumb inside) that is the stuffy part. Grill eggplants and zucchini in a grill pan or regular grill. Place in a mixing bowl with sliced roasted peppers. Add parsley, oregano, olive oil, salt and pepper. Set aside. Cut country bread in two, grill on a grill pan or regular grill. Spread 1 tbs. of tapenade on each slices of the bread. Add arugula, avocado, grilled zucchini and eggplant. Add sundried tomatoes, roasted peppers and goat cheese. This entry was posted by silvia on November 1, 2009 at 9:41 pm, and is filed under Breakfast/Brunch, Vegetarian - dairy. Follow any responses to this post through RSS 2.0.You can leave a response or trackback from your own site. This photo is absolutely gorgeous! The sandwich looks amazing! 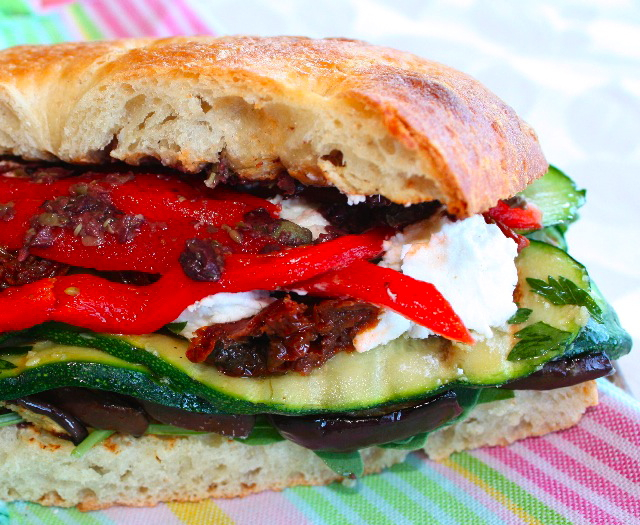 This sandwich looks phenomenal stacked with all those vegetables! I like the layers and the colours of this sandwich. Sandwich will be the way to go for me without a kitchen soon! Funny – New Orleans baguettes, the ones for po’boys, are crunchy on the outside with a light airy minimal crumb inside. Must be the French heritage! Same thing for Vietnamese banh mi baguettes. This is perfect. This is a standby recipe for me to make. The color is beautiful. And it’s exactly what I want to have for a vegetable sandwich – the olive tapenade, the grilled vegetables, of course arugula and another favorite cheese, goat’s cheese. It’s yum. What a beautiful sandwich! I can’t wait to give this a try. A gorgeous sandwich. Good luck getting through the next little while! it’s a gorgeous sandwich!very elaborated! What a rainbow of flavor! This would make for a great warm salad, too! Oh wow, this looks grewat! This looks like a great Meatless Monday dish. Thank you.